Our best meeting yet! That has the been the input that we have received so far. 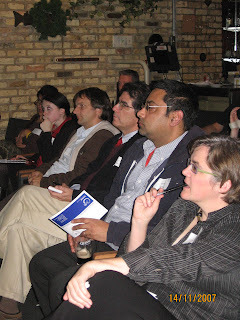 This is thanks to our speakers, Erin Rae Hoffer, Jay Polding and Chien Harriman and of course to the over 50 people who attended and volunteered. Erin Rae Hoffer - AIA, LEED AP, MBA set the tone for the evening. Integrating all team members earlier in the design process makes for a better end result. She also shared a glimpse into the future by narrating a video of Autodesk’s presentation at Greenbuild. This presented an easy to use interface that illustrates how closely BIM and sustainable design can function. 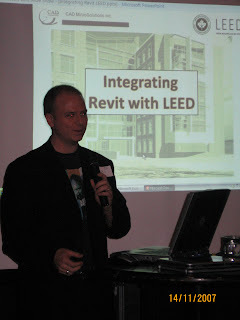 Jay Polding, LEED AP presented an integration of exisitng Revit tools with the LEED standard. Using the basic modeling tools, schedules and parameters one can uncover many key peices of information pertaining to occupancy, parking, water flow, material take-offs and much more. 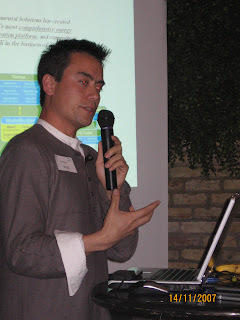 Chien Si Harriman from Integrated Environmental Solutions had our attention. Using the link between Revit Architecture/MEP and IES Virtual Environment he was able to analyse energy consumption, daylighting and dassive solar among other things. He demonstrated how one can easily compare various design options quickly and early in the design process. This Beta test will run until the 20th of December i.e. you will be issued keys for supporting software until the 20th. This download is about 370MB and can take up to 30 minutes to download. Please note that we have just uploaded a new website. If you have any problems getting to the website or downloading then contact Beta@iesve.com.You must have the June 2007 (or later) update of Revit Architecture for our link to work. An involved group. Please email Jay Polding any comments or ideas for our next meeting. The City of Toronto is planning to redevelop the North St Lawrence Market. Join a green team of architects, energy and environmental engineers and other design professionals at this sustainable building Design Charrette. Apply your experience and technical know-how to the proposed new north St Lawrence market complex in Toronto. Date: Dec 4 (lunch) and Dec 5 (8:30-4:30), 2007. A limited number of spaces are available. There is no cost but selection will be primarily based on the expertise needed by the charrette- ESPECIALLY electrical engineering, building envelope and structural. When: Wednesday, November 14th from 6:30pm to 9:00pm. Industry Programs Manager with Autodesk, a leading provider of software for architecture and engineering, Erin Hoffer fosters the adoption of innovative approaches to design and practice. 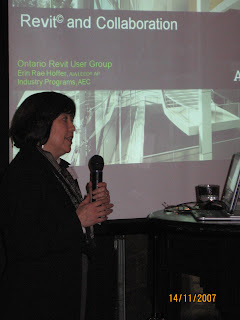 With twenty-five years of experience in technology and computer-aided design, Erin contributed programming for D.O.E solar energy analysis software in the early 80s, developed computer-aided design tools and techniques for architecture and engineering with Skidmore, Owings & Merrill. Prior to joining Autodesk, Erin served as Executive Vice-President with the Boston Architectural College and served on the board of directors of the Boston Society of Architects as Commissioner of Technology. She led technology and services organizations for Harvard, MIT, and Tufts University. She is a LEED Accredited Professional and member of the AIA. Erin received a Master in Architecture from UCLA, and a Master in Business Administration from MIT's Sloan School of Management. She is registered to practice architecture in California. Learn the secrets of extracting key LEED data from your Revit model. We will compare existing tools and techniques inside of Revit with the information required from the LEED Letter Template. Chien Si Harriman from IES will show us how daylighting, energy consumption and other important simulation data can be calculated using IES simulation software. Revit Matchmaking Tables: Revit Architecture, Structure and MEP stations will be set up for those who are looking to collaborate on Revit projects. Registration: Please email your interest in attending to Jay Polding at jpolding@cadmicro.com as soon as possible.